STO Devs Play Star Trek Tabletop Live on Wednesday! 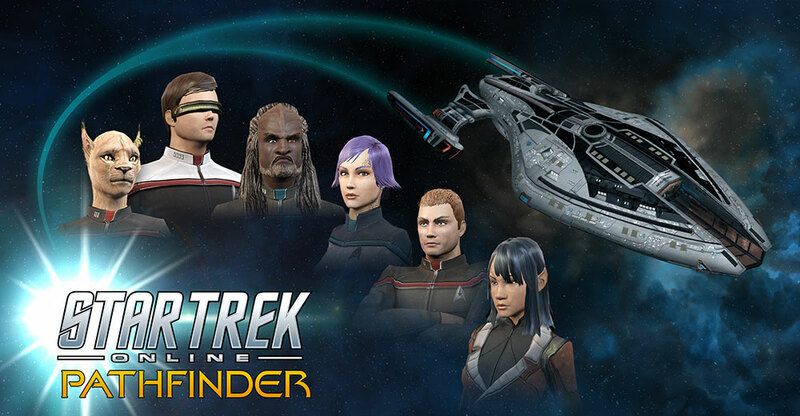 This Wednesday, August 23rd come and watch some of the Star Trek Online development team form a crew and explore the galaxy, in a live stream play of Modiphius’ new Star Trek Adventures tabletop roleplaying game. The stream will take place at 5:30 pm PST (instead of the usual 4:00 for Ten Forward Weekly), and will follow the story of the U.S.S. Pathfinder and her crew on a mission of science, exploration, and probably some phasers. What: Members of the STO Dev Team play Star Trek Adventures! The U.S.S. Pathfinder (NCC-97600) was developed as part of Starfleet’s “Four Quadrant Strategy,” (4QS) which was designed to help them explore and defend the brave new frontiers created by the Iconian Gateway Network’s activation. It represents one of the most advanced and flexible ships of its type and is perfectly suited for the rapid survey missions required by 4QS. Sporting a quantum slipstream drive and cutting-edge scientific equipment, Pathfinder and her sister ships will be at the vanguard of Starfleet’s revitalized exploration efforts. Captain Thomas Marrone began his Starfleet career as an engineer, specializing in computer systems and interfaces. Throughout the course of his service, he saw duty on both starships and starbases and gained some infamy as the leader of the team that “turned the LCARS blue” when implementing a major software update cycle in 2407. Despite a few raised eyebrows, the update proved to be successful and Marrone, having completed Command school, earned promotion to Captain and a billet as commanding officer of the new U.S.S. Pathfinder. Six months into her first deployment, the Pathfinder has survived the ravages of the Iconian War and Marrone is eager to take his ship into the great unknown promised by the Starfleet recruiting posters that captivated him when he was a young boy. Commander Kyona was born on Cait and raised in a small agricultural community known for being “nice, if a little dull.” Joining Starfleet in pursuit of an exciting career, she was assigned to U.S.S. Belfast under Captain Shon, serving with valor during the Dominion Incursion. After the unfortunate destruction of the Belfast, Kyona was transferred to the crew of U.S.S. Enterprise-F as chief security officer. She served with distinction there for some time, transferring to U.S.S. Pathfinder after the conclusion of the Iconian War. As the Executive Officer, she brings strong security and tactical skill sets to the job, aiming to keep the vessel as safe and sound as possible while it boldly goes where no one has gone before. Ethan Yeager is a tall well-built human, with dirty blond hair and unusual, slightly luminous, blue eyes. Ethan grew tired of living in an isolated colony and left to explore the galaxy, and seek new challenges, eventually finding his way into Starfleet. Being an augment Ethan has experienced more than his share of mistrust. The first few years of Ethan’s career were difficult and tested the limits of his patience, but he’s committed to proving that not all augments are Khan Noonien Singh. Community Manager Mike Fatum is playing Thox, a Klingon Science Officer in Starfleet. If that sounds like a contradiction, it is. Thox grew up on a remote science post, and while he is very much a Klingon, he joined Starfleet to explore the universe, believing he could find more honor by discovering the stars than by slaughtering his enemies. Even so, he was dragged with the rest of Starfleet into a bloody war against his own people, the scars of which have still not completely faded. Tiffany Chu, STO Content Designer, is playing Doctor Lera Jenan. Growing up on the Trill homeworld, she sought to be one of the few elite joined Trills while focusing her studies on medicine. Selected by the Symbiosis Commission, Lera was ready to accept a Symbiont whose host was badly injured. However, the injuries were more grave than expected, and within hours of joining, the Symbiont died. As the joining wasn’t complete, Lera recovered, but she found a new purpose in life – to live fully, and gain “immortality” by doing so much good, history books will have to mention her. Tellan Myrrai has been a pilot for Romulan Republic since practically its inception. She is a Republic hardliner who idolizes D’Tan – some have called it a crush, but those people have had trouble walking since. When D’Tan was seeking volunteers for a cultural exchange with their allies in the Federation, Tellan knew that this would be an exciting chance to further the Republic’s agenda. The helm of a Starfleet ship probably isn’t that different from a Warbird, right? Jesse Heinig is a Staff Game Designer for Star Trek Online, who has a long history working on Star Trek properties. For the purposes of our game he will effectively be an omnipotent alien entity known as The Gamemaster. And that’s the team! Be sure to tune in Wednesday, August 23rd at 5:30 PM PST to watch us explore strange new worlds, seek out new life and new civilizations, and boldly roll some dice.